This perfect slice of ‘cozy crime’ is narrated in the voice of a pre-war English butler and concerns a rich and powerful businesswoman whose daughter goes missing from their country house estate. That the story-teller is a robot belonging to an impoverished detective brings a fresh and original take on ‘cozy’, and as for ‘crime’… well, it does begin to escalate, what with MI6, criminal gangs, corrupt police, and that’s not to mention international cybercrime! Originally, I really liked the concept of this book – it was different, and maybe that’s why it ended up not being for me. Maybe my little head just isn’t used to the change. It was a very intriguing read; PArdew was loveable, and his quirks really helped move the book along. Duck Egg Blues had me giggling at times and the short sentences made for a very quick read (despite some being cut off mid-sentence). It all comes together nicely at the end and doesn’t leave you asking too many questions, which is key when it comes to a crime mystery. It is very quirky and props to Ungless for being so imaginative and creating this! 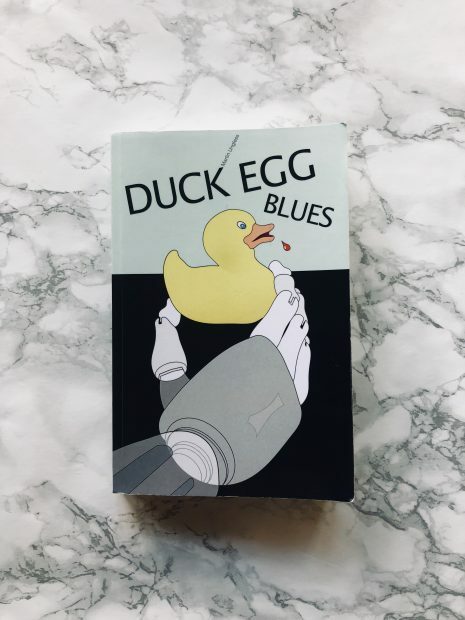 If you’re looking for an imaginative twist on the traditional crime mystery, try Duck Egg Blues.